Leaf-miner: Larva initially feeding in a gallery which turns to a blotch and finally one or more conical folds are made (UKMoths). The mine begins as an, occasionally quite long, lower-surface epidermal corridor. Its last section is widened into a blotch. 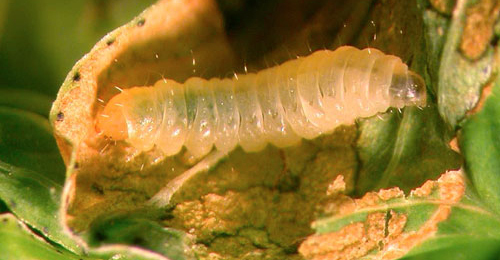 Only then the larva begins to consume parenchymatous tissue and to line the inside of the mine with silk. The upper surface of the mine turns orange brown, and the leaf folds itself around the mine. Frass in a clump in a corner of the mine. In the end the larva leaves its mine, and then lives free in a leaf tip that has been folded downwards (Bladmineerders van Europa). Time of year - larvae: June; September-October (British leafminers). Time of year - adults: There are two generations, moths being on the wing in May and August. The flight time is evening onwards, and sometimes it can be attracted to light (UKMoths). Distribution in Great Britain and Ireland: A fairly common and well-distributed species throughout much of the British Isles (UKMoths) including Anglesey, Bedfordshire, Berkshire, Breconshire, Buckinghamshire, Caernarvonshire, Cambridgeshire, Denbighshire, Derbyshire, Dorset, Dunbartonshire, Durham, East Cornwall, East Gloucestershire, East Kent, East Norfolk, East Suffolk, East Sussex, Flintshire, Glamorgan, Herefordshire, Hertfordshire, Isle of Wight, Kincardineshire, Leicestershire, Merionethshire, North Aberdeenshire, North Hampshire, North Lincolnshire, North Somerset, North Wiltshire, Nottinghamshire, Pembrokeshire, Shropshire, South Aberdeenshire, South Wiltshire, Stafford, West Cornwall, West Gloucestershire, West Lancashire, West Norfolk, West Perthshire, West Suffolk, Westmorland and Worcestershire (NBN Atlas). See also British leafminers distribution map, as Eucalybites auroguttella. Also recorded in the Republic of Ireland and Northern Ireland (Karsholt and van Nieukerken in Fauna Europaea). See also Ireland's NBDC interactive map as Eucalybites auroguttella. Distribution elsewhere: Widespread in continental Europe including Albania, Austria, Balearic Is., Belgium, Bosnia and Herzegovina, Corsica, Croatia, Czech Republic, Danish mainland, Estonia, Finland, French mainland, Germany, Greek mainland, Hungary, Italian mainland, Latvia, Lithuania, Luxembourg, Macedonia, Norwegian mainland, Poland, Portuguese mainland, Romania, Russia - Central and Northwest, Sardinia, Sicily, Slovakia, Spanish mainland, Sweden, Switzerland, The Netherlands, Ukraine and Yugoslavia. Also recorded in the Near East (Karsholt and van Nieukerken in Fauna Europaea).